More than 400 sailors and three dozen civilians were being tested for tuberculosis after a sailor aboard the USS Ronald Reagan was diagnosed with the infectious disease. 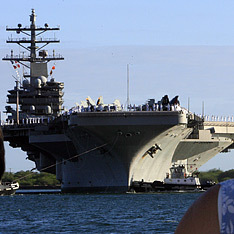 Navy officials said Tuesday that the 32-year-old sailor was hospitalized last week with active tuberculosis. The Antone and Edene Vidinha Charitable Trust awarded $10,000 to the American Lung Association of Hawaii for its Kauai Asthma Sports Day Camp. The camp, for children ages 5 through 12 with asthma, provides asthma management education and an opportunity to participate in sports. » Friends of Hawaii Charities Inc. donated $10,000 to Goodwill Industries of Hawaii to retrofit and install energy-efficient lighting equipment at its Beretania Street offices. Located there are the group's job placement and training center, youth-at-risk program, and employment and community services for people moving off public assistance. » The Honolulu City & County Employees Federal Credit Union donated $2,269 to the Kapiolani Children's Miracle Network. The funds were raised by credit union members and staff by selling baked goods and entertainment books. » Friends of Hawaii Charities Inc. gave $5,000 to Hina Mauka Teen C.A.R.E. for educational equipment and supplies. Teen C.A.R.E. (Counseling Awareness Rehabilitation and Education) provides alcohol and drug treatment to more than 600 teenagers annually in cooperation with the state Departments of Education and Health. » Fifty companies raised more than $45,000 at the 12th Annual Golf Tournament for the Boys and Girls Club Hale Pono Ewa Beach. Ocean Pointe developer Haseko was the major sponsor of the tournament at the Hawaii Prince Golf Club. Others included the James Campbell Cos., American Savings Bank, Grace Pacific, RM Towill and Royal Contracting. A Waimanalo man convicted of shooting to death his bookie in December 2004 was sentenced to the statutory maximum of life imprisonment with the possibility of parole. Circuit Judge Steven Alm was also bound by the decision of the jury, which also found that Donny Hiramoto used a firearm in committing second-degree murder by shooting Makiki apartment owner Robert Lee. For using the firearm, Hiramoto, 32, must serve at least 15 years before he can be paroled. Defense Attorney Jeffrey Hawk said they plan to appeal. He had argued Monday that the jury got the verdict wrong. At trial, the defense had maintained that Hiramoto was at Lee's apartment building that evening to pay off a debt but fled after he allegedly saw two unidentified men in a car point a gun at Lee in the parking garage and heard shots fired. A judge has found a 51-year-old Kapahulu man fit to go to trial for the alleged murder of his wife. Based on the reports of three court-appointed doctors, Circuit Judge Marcia Waldorf made the determination yesterday that Danny Lam was capable of understanding the charges against him and the consequences and is able to assist in his defense. Waldorf set trial for Sept. 18. Without going into detail, defense attorney Howard Luke said they intend to file notice that they will be relying on the insanity defense. "There's no question he's suffering from a mental illness and disability, so based upon that, we think a jury should decide the issue of whether he was responsible for his conduct under the law." Lam, a real estate agent, called 911 on June 11, 2005, and told a police dispatcher that he had killed his wife. When an officer arrived at the couple's Kaunaoa Street home, Lam allegedly apologized for killing his wife and directed the officer to a downstairs bedroom. Melody T. Lam, 41, also a real estate agent, was found lying on a mattress with severe head injuries and a large hammer nearby. Lam allegedly confessed at the hospital later that voices told him to kill his wife by using the hammer. Neighbors had said the couple had problems with their marriage and that Lam was upset that his wife was talking about getting a divorce. At least one of the doctors found Lam was not legally responsible for his actions at the time of the offense. A Honolulu gynecologist/ obstetrician faces a five-year prison term when he is sentenced in October for tax evasion. Stephen Wilson pleaded guilty Friday to income tax evasion for 1998. Federal prosecutors agreed to drop a second income tax evasion charge for 1999 in exchange for his guilty plea. According to his plea agreement, Wilson earned $376,969 in 1998. The tax he should have paid is $138,552. Instead, he reported earning $46,915 and paid just $9,840. He also faces a fine of up to $250,000 when he is sentenced Oct. 26. A brush fire near Highway 190 and the border of the North Kona and South Kohala districts ravaged at least five acres of state land yesterday. The Hawaii Fire Department said approximately 24 personnel, including seven volunteer firefighters and seven Department of Land and Natural Resources officers, used tanker trucks, firetrucks and a helicopter to battle the blaze. The fire near the 15- and 16-mile markers of the highway that runs from Waimea to Kona was reported around 2:43 p.m., and firefighters were still trying to bring it under control last night. LIHUE » Kauai police are awaiting autopsy results on the body of a woman found in a minivan she appeared to be living in. The woman, found Tuesday in an lot on Poinciana Street at about 9:30 a.m., was not identified pending notification of her family. Kauai police said their investigation has not found any signs of foul play. A 44-year-old woman allegedly broke her husband's wrist Sunday night when she hit him with a rolling pin. Police said the couple were arguing near Lewalani Drive and Clio Street in Makiki at about 11:15 p.m. when the wife hit her husband, 38, with a massage-type rolling pin. The husband was treated at an area hospital, where it was discovered he had a broken wrist. Hospital personnel informed police, and the suspect was arrested for investigation of second-degree assault. A 25-year-old Kailua man was charged Monday with five counts of sexual assault for allegedly assaulting a 20-year-old woman Saturday. Police arrested Ines Jose Ramos at 12:08 p.m. Sunday at his Keolu Drive home on suspicion of sexually assaulting the woman between 1:30 and 3:30 a.m. Saturday at a Kailua house. Police said the two had mutual acquaintances. The victim reported the incident to police and identified Ramos in a field lineup. Ramos was charged Monday with three counts of first-degree sexual assault and two counts of third-degree sexual assault. He was being held in lieu of $100,000 bail. Honolulu police are looking for two men who allegedly robbed two other men Tuesday night at a Leeward gas station parking lot. The suspects, both in their 20s, allegedly approached the victims while they were parked in their car in front of the Kapolei Shell gas station and convenience store at about 11:30 p.m. and demanded money. One of the suspects allegedly pulled out a handgun and repeated the demand for money, and the victims complied, police said. The first suspect is described as 5 feet 6 to 5 feet 7 inches tall, about 170 to 180 pounds, bald with a heavy build. He was last seen wearing a black T-shirt and blue jeans. The second suspect is described as about 5 feet 6 inches tall, 160 pounds, with a mustache and medium build. He was last seen wearing a gray tank top and blue jeans.